Sorry for late posting! Week 3 actually finished last Monday, but life got hectic. 1) Did you do the morning pages? 2) Did you go on an Artist’s Date? Did I ever! I spent the weekend at a healing retreat. I might explain the whole process in a later blog. For now, it involves turning unresolved stuff into metaphors and allowing these to be resolved in a dream-like story. A lot came up for me; one particularly potent image was of a pool of cool water, the sunlight glinting on it. Once one of the stones by the pool was removed the water began to flow out and as it did, more water flowed in from the other side, so that there was a steady stream of water which never ran dry. This felt like my creativity; there’s unlimited quantities of it, the only question being the speed at which I allow it to flow. This work also involved doing a lot of drawing of the images, creating fantasy maps of how the image-world was forming which I might photo for you at some point. I did art GCSE and made a fairly pleasing portfolio of work and then haven’t really picked up a crayon/2B/paintbrush since. Felt really good. 3) Anything else come up? Julia talks about anger being a powerful indicator of the areas in our life that need addressing or the actions we need to take. During the course of a day we can flit from one state to another a hundred times, although we might have one state which is most common, sort of our default setting. Each of these worlds has positive and negative aspects (apart from Buddhahood which is ace-ness incarnate.) For example, compassion is great but if you are supporting others so much that you suffer yourself it ultimately has a negative effect. On the other hand, anger can feel pretty unpleasant, and be very destructive, or it can motivate you to make changes, to stand up and challenge those things in yourself or your environment which are unacceptable. This week some old anger resurfaced about a particular crazymaker who exposed me to some very powerful and protracted abuse, to the extent that it didn’t so much make my creativity dry up as made me not even want to create. I went back to an exercise from week 1 and wrote this person a letter (never to be sent.) I discovered a number of things. First, I was actually, in my heart, grateful for the experience. It came along at a time that I was doubting my abilities both as an artist, and as a human being able to cope with the world. I wanted easy and the universe gave me a challenge tailor-made to strike all my weak spots. My first encounters with this crazymaker made me want to run away. But as the bullying went on I found (with support from my friends, Buddhist practice and some therapy) that I was infinitely stronger than I had believed. Once I realised I that, the crazymaker could make my life difficult but couldn’t actually hurt me anymore, I was able to leave, not running away from fear, but walking away from an abusive relationship with wisdom and self-compassion. And overall the experience has made me a stronger, and happier person. Next I realised that this person must have been suffering terribly. This in turn made me realise I was no longer angry with the person (I pitied them, which is still pretty disrespectful, but I’ll work on that). But I was still angry at their behaviour. 1) Learn to protect my creative work from crazymakers. 2) Constantly check that I’m not becoming one myself. 3) Develop ways of working which protect my colleagues and collaborators from similar abuse in the future. Thoughts on how to do those, gratefully received! I’ve spoken before about Julia’s idea that trusting God to take care of your creativity, weakens your inner critic and lets the creativity flow. But we also need food on the table and opportunities to make work. Here she talks about the way in which the universe will support those who make, if not leaps, at least gentle baby steps of faith in their creativity. For the hard-core rationalists amongst you this might be a harder pill to swallow, but as with the God concept, even if it’s a placebo it may be a powerful one. ‘The moment one definitely commits oneself then Providence moves too. This week I have experienced a lot of synchronicity, but not a fun kind. Events have come up to challenge certain weak spots. Now I’m on the look out for what Julia talks about here, the universe offering support for the next steps. I have seen a lot of deep personal change over the last few years, remarkably so. The universe has now given me a warm, supportive environment in which to do this course. But I want more, the conspicuous way forward, that feeling of the universe rewarding brave leaps with significant breakthroughs. Here’s hoping. . . The next sections deal with Shame and Criticism. I was furious. I stomped about a bit muttering about the duty of the artist to be open to any source of feedback which might improve the work. And then slowly, begrudgingly I admitted to himself that he was right. I take input from everyone involved in the show throughout the process. But once it’s open; what are we going to do if an audience member doesn’t like the set? So I stopped reading reviews. I wanted them to be good for ticket sales, but I didn’t read them. Friends and relatives came and wanted to dissect the pieces with me at length and I would ask them how they were doing. I know this sounds amazingly arrogant. In theatre, actors can’t see themselves act. Novelists can’t sit there as their readers read the book. But, for a director, we know if our work works, because we sit amongst the audience and can feel what they feel; we are the audience. If the electricity is sparking in the room you can feel their hair raising, feel them holding their breath. If they’re bored you sigh in unison with them. The skill is in knowing how to address the bits which don’t work and that is the struggle for us all, because unpicking whatever it is will involve a great deal of insight into the play, production, and the temperament of the creatives involved. Which is information you have but most audience members won’t. Chances are they will tell you what they would have done to make it more like their ideal production, rather than what you should do to make it yours. There are some, sympathetic, insightful and experienced people who can do that but it requires both immense technical knowledge and a great generosity of spirit. Which is pretty rare. Or maybe I am being arrogant. If I am, I’m pretty sure, by then end of week 3, that the Morning Pages will tell me. And now, I’ve just read chapter 4 and apparently this week I am not allowed to read. Anything. Not quite sure how that’s going to pan out. . . I know I’ve banged on a lot about Buddhism on this blog so far. It’s not so much that I’m selling it to you, as that, after ten years, this stuff is pretty integral to how I think. So it would be impossible to talk about something as personal as this creativity course without drawing on my practice. I can, however, put this object in to show I’ve kept my sense of religious irony. In my form of Buddhism we don’t revere figures of the Buddha. The idea is that Buddhahood is a force to be found within all living beings (let me know when I sound like Yoda) so giving it a specific face might make it seem that it’s a quality that Shakyamuni had and which we can’t access. 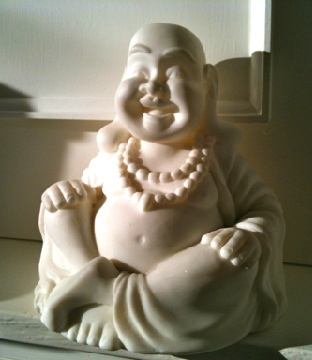 So in general I avoid having Buddha statues around the house. But this is no ordinary Buddha. You ask him a question, turn him upside down, and where his bum should be is a little window where a Magic 8-Ball style die will bob saying something like, ‘Use the Zen.’ His advice is utterly useless. But whatever problem I take to him he always makes me laugh at about it. Which I guess is pretty damn profound after all. 1) It was bought for me by a very dear friend. 2) It was a gift marking the end of a very difficult period of my life where I was profoundly unhappy. 3) There were many external reasons to be unhappy at that time but the internal one was distress at not being where I wanted to be in life. It reminds me of the Buddhist concept that ‘Earthly Desires Are Enlightenment.’ This is the idea that we are always going to want things; that’s being human. (Even having the desire to get rid of all desires, is, itself, a desire. Phew.) The question is; do we use those desires to beat ourselves up? ‘I can’t be happy till I’ve got X, Y, etc.’ Or do we use the desire to help us grow? ‘I’m going to change whatever in me needs to change to achieve X, and I’m going to love every minute of it!’ At that point what we want is sort of irrelevant; we are using the desire to motivate our spiritual growth. And being fulfilled in the meantime. 4) The dear friend in question is a Christian and, while I understand the phrase in the Buddhist terms above, I love that wise stuff is open to all of us to share, regardless. 5) It is one dot short of an ellipsis. Which I am sure is the punchline to a pun I have yet to write. 6) It holds down my papers when it’s windy. This week I have been ill, having been surrounded by the intensive-germ-incubation-and-distribution-units you Earthlings call ‘Children.’ Still it’s given me time to focus on Artists Waying. So here are my thoughts at the end of week 2. 1) How many days this week did you do your morning pages? See the Inspirational Items posts! 3) Anything else significant come up? Making deep changes are scary; we might not like our pain, fears and doubts, but they are ours; they are familiar. Changing is scary and unfamiliar. But I’ve changed big things before, albeit with great effort, so here goes. . . This section deals with the inner negative voice, the inner critic. I’ve spent a fair amount of time wrestling mine over the years. For a long time he would tell me I was a failure every time I was less than perfect. Unsurprisingly, I was never perfect, so I heard from him every day, and often that led to me not trying at all, and crawling back under the duvet. So I looked for ways to nudge my thoughts in a more productive direction (through things like Cognitive Behavioural Therapy) or to dial them down (through meditation or Mindfulness training.) I settled on my Buddhist practice because by chanting to achieve my goals and desires each morning, I was freed up to focus on each of the day’s activities without fretting about the end result. It takes a lot of effort to live like that, as if each thing you are doing is important enough to deserve your full attention, and the chanting certainly helps me bring forth that energy. I also found therapy to be very useful, in that it enabled me to unpick how the Critic got to be so strong, and why I was so inclined to listen to him. I’m learning to focus on improving myself, rather than perfecting myself. Any day I take a step forward (rather than being perfect) is a win now, and so he’s quieter these days. But he is still there. So I look forward to seeing how morning pages and the exercises might pipe him down further. Even in week 2, a thought pops up during the day and I think to myself, ‘I wrote this thought down this morning; I don’t have to think it again.’ And off it slides. Early days, but interesting. Reading this section it occurred to me that maybe blogging this process was not a great idea, as it’s a very personal process. Fortunately, so far it feels like a slightly patchy Artist’s Way Group. I’ve received a lot of supportive messages, and also discovered lots of people who’ve already done the course and had great benefits, which has been great. And a big thank you to everyone who’s doing the course in tandem with me! At various points in my life I’ve had people in my environment who would count as Poisonous Playmates; people who are creatively blocked and would oppose my attempts to free my creativity up. At the moment, however, I am fortunate to be surrounded by support and encouragement. I’ve known people like this, personally and professionally, all my life, but let’s focus on the work front. Now, I’ve only lived one life (that I can remember) and I’ve lived it in theatre. As a result I cannot say that theatre attracts crazymakers any more than any other industry. Before I go further I should be really clear that I know a lot of very sane and lovely theatre makers! But I have met dozens of crazymakers in the industry so it’s worth raising the question. There’s an annual, and very brilliant, self-organising theatre conference hosted by Improbable Theatre called Devoted and Disgruntled. At it anyone call a session on any burning issues they have. This year someone convened a session called Working With Dickheads and it was hugely popular, so I’m evidently not alone in being effected by this. There is an old theatre joke: ‘There’s a wanker in every company. If you can’t figure out who it is, it’s probably you.’ But again, how do I know that I’m not a crazymaker? I was once on my first production. Aged 18, the wonderful Jill Adamson, now head of National Association of Youth Theatres (link), then head of Youth Theatre Yorkshire, let me direct a show. I behaved fine until the first night, when sitting amongst an audience watching my work proved too much for me. One of the cast misremembered a line and I took it as a personal slur and blew up at him after the show in front of the rest of the cast. Jill took me off till I calmed down, then I went back and apologised to everyone. I promised myself that I would never behave that like that again. Through my Buddhist practice I started consciously putting effort into supporting the people around me. I quickly discovered that when I put supporting the emotional needs of the cast first, the productions got better. In the very early days of the Young Vic Young Directors Forum someone posted a question asking directors to suggest the qualities of a good theatre director. I included Empathy and Compassion in my list. I got an amazingly irate response; including one director who said that my list might describe a good person, ‘but has nothing to do with directing.’ He then declared that, ‘Tom represents everything which is wrong with British theatre.’ A few months later I worked with a group of students who had worked with this particular director. I asked them how they had found it. They described their experiences as bullying and, for some of them, as sexual harassment. I knew another director who deliberately bullied his cast and then said, ‘The work only really starts when the actors are really suffering.’ This was on a children’s Christmas show. What makes this sort of behaviour so sad is that theatre is, by definition, a collaborative art form, and everyone has come on board with such high hopes. Every actor, designer and director is opening up their work to a paying public. It could be a remarkable team effort, a group of people putting aside personal ego to create something remarkable in an environment of mutual support. But the vulnerability required from communal art making leaves us vulnerable to those who, for whatever inner psychological need, seek to manipulate or dominate. I have let people down, failed to protect them from crazymakers, which I deeply regret, but I hope that I have avoided being one myself. I also hope that this process will give me the strength to deal with them in the future, or the wisdom to avoid them! A few people who have started on this journey with me have expressed a problem with the God-language. Julia seems to be clear that this isn’t necessarily a God who expects you to turn up to a particular Church every Sunday. I think she’s talking about trusting to a force that’s greater than ourselves. Maybe if it makes the process easier for you, you should go through and tippex out every instance of God and replace it with ‘my own higher wisdom,’ ‘my own unconscious creativity,’ ‘life-itself,’ or whatever you feel comfortable with. Special props to Mr Alex Soulsby for suggesting ‘The Creative Energy that Will Eventually be Explained through Neuroscience’ or ‘A certain, beautiful sensation that will never be explained properly, as the human mind simply isn’t designed to understand the human mind.’ On the other hand, God is shorter. . .
Cameron’s argument seems to be that if you get your self-critical voice out of the way, creativity will naturally emerge and, as creativity emerges from within, so will opportunities from without. I like this (not least because I could do with some conspicuous lucky breaks). If it’s not literally true, it seems to chime with the subjective experience of many great artists. So for those of you alienated by the God language, suspecting it’s some sort of spiritual placebo, I say, let’s take the pill. Then in another ten weeks we can debate if and how it worked. I have had man-flu so I wanted a house bound Artist’s Date for Week 2. I have never really been into photography; don’t know why, as I’m very interested in composition on the stage and it might help develop my eye. So, I thought I would take pictures of Inspiring Things in my room. Conveniently there are 12 in all, so I’m going to post them once a week until I’m done. I wasn’t allowed guns as a child. I managed to sneak some tiny ones into the house on the basis that they were held by cars which turned into robots and so won’t real, but in general, no guns. And while I envied the cap-gun six-shooters of my peers, I did, sort of, agree with the point my mother was making. Even when very little I would watch the A-Team emerge, theme tune-a-pumping, from a barn, having made a tank out of a dune buggy, some egg-boxes, sticky back plastic and several machine-guns. And they would be firing the machine guns at the baddies, who would fly in the air (over the camera – ooh!) and then land. And then go ow for a bit before hopping off home looking shame-faced. And even at age 5 I understood that if you fire a machine-gun at someone, they don’t leave limping. And I thought that, maybe, pretending that they did was abad lie. The Doctor doesn’t (in the vast majority of cases) shoot people, aliens or sentient robots. Instead he uses his brain and a little shrill light on a stick. And the fact that he takes such effort to avoid taking life is why he is a hero. Maybe there isn’t a non-violent solution to every situation. Doesn’t make it excusable not to try. So what I’m planning to do is share my end of week check-in with you. Due to my erratic lifestyle this will be somewhere from Friday to Monday. There’ll be any personal thoughts on the chapter of the week (not a précis; don’t want to do Julia Cameron out of sales) and observations on the tasks. I’m not going to put up my morning pages, since so far, they are filled with invective about how tired I am, half-baked sexual fantasies and over-involved to do lists. Nor, necessarily, am I going to inflict the exercises themselves on you as I don’t think anyone wants to read a rebuttal of my first year English teacher’s marking of my essay on ‘The Highway-man.’ Actually, that one was pretty funny. The chapter also begs a difficult question; is that what a director is? We didn’t come up with the story or the words it’s told with, nor are we up there bringing it to life every night. While theatre in some form has existed since the beginning of culture, directors as a role seem to have been around 500 years or so, mainly born out of the economic necessity of producers wanting to know who to blame. I suspect this is a question I will keep coming back to. It was my birthday last week so age has been on my mind a lot. Age is a dangerous thing. Not being old per se, but having a number attached to us. Once we start to define ourselves by this number there are people, living or dead, with a lower or equal number who have achieved way more than us. This comparison has eaten up some people I know, and has hacked a few chunks out of me too. I was very, very fortunate at the start of my career; immediately after leaving university I got one of the most prestigious director traineeships available, so I spent my first few years as a professional feeling like top of the class. Then people started to overtake. So, if I’m a peach (stop sniggering at the back) I want to be the peachiest peach I can be. What point is there worrying about being out-appled by the Granny Smith in the bowl? So what I’m hoping to get out of this isn’t a recipe on how to get a show on at the National, but rather how to be making the work which only I can make. I love this section. We tell lies about what it means to be an Artist. The one about suffering is brilliantly addressed here, so instead I’m going to focus on bad behaviour and poverty. Sure, there are incredibly creative people who behave appallingly, destroying the people around them, or themselves, burning up in a flash of creative vision and leaving some amazing art, and a lot of broken people behind. But that doesn’t mean that’s the only way to do it. The myth that it is the only way is dangerous. And we’re all guilty of keeping this pernicious lie alive. When I met him I realised his only genius was in behaving so badly that everyone assumes he must be great. I’m sure I will come back to bad behaviour in the theatre as a theme, often. But the point for now is that beliefs like that, or believing that being an artist will lose you friends, family and leave you starving in a garret, dying of consumption, will block the flow of creativity. 1) You are offered five studio shows in a year. Theatres have less council, Arts Council and box office revenue to play with, versus mounting costs; more and more shows are being produced by groups of theatres and touring to each (so there are less total shows being produced.) But let’s say you are lucky, driven, charming and good enough to be offered five paying gigs. Given that you have to prep, find a creative team, cast the show, lead at least three weeks rehearsals and a tech week, come back to maintain it and be pitching to get more shows, I think five is the absolute maximum without failing to sleep/going insane/doing terrible work. 2) Amazingly there are no clashes and you can take all five shows. The odds of those three things happening, assuming you are brilliant and hard working, is just shy of winning the lottery. And what’s your income from this amazing, unheard of, lucky streak? (Which will not leave you any time to temp, I promise you.) £15,000. When I was on the National Studio Director’s Course (ooooh, hark at ‘im) I attended a brilliant workshop led my Matthew Dunster. There was one particular exercise where we were asked to imagine we were on our deathbed, having lived a full life. What would be the one thing of which we were most proud? So I’m all for making sacrifices for my art, but £15,000? If I’m lucky? Are we saying that theatre is a game which can only be played by the independently wealthy? (Expect a separate blog post on this some time soon.) So, yes, if I want, one day, to impregnate a lady (relax, ladies, not right now) and raise the resulted human being in a stable, supportive environment, something big is going to have to change. So, Julia Cameron? Do I have a negative belief about artists? Yes, I do. So apparently I turn it around and write, in the present tense, what I want to be true and I write it out in my morning pages. Come on Creative Force of the Universe, get to work on that. 1) How many days this week did you do your morning pages? How was the experience for you? I missed one morning. Not too shabby. I took my journal into work, having failed to do it before leaving the house, but didn’t make the time there either. Other times I’ve written them on trains, in very shaky handwriting. Feels a bit like making contact with an old friend. And then discovering that the friend is perpetually grumpy about how early in the morning it is. 2) Did you go on an artist date this week? I did. I took myself off to Bettakultcha which is an evening in which people present a five minute lecture, accompanied by 20 slides set to change ever 15 seconds. The presenter can talk on any subject, providing they are not selling anything. The audience is encouraged to tweet throughout. Apparently it’s a bit like something else which sounds like Pikachu (but isn’t) and where they have 30 seconds per slide. In fact, it’s almost identical, but shorter. We had presentations on a refuge for potential suicides, the Captain of the Beagle, pre-history, the Killing Joke, logical fallacies and one on volunteering to support a woman with Down’s Syndrome which made me cry. It was great seeing people, often non-professionals, talking about their passions. It left me pondering; what am I passionate enough to get up and talk about for five minutes? Or, maybe, blog about. . .
3) Were there any other issues this week that you consider significant for your recovery? Well, see above, I guess. See you next week! P.S. Will aim for shorter blogs in the future – well done for getting to the end!